As noted in a previous blog post, Options Jive is a segment on the tastytrade network focused on broad-based discussions across the realm of options trading. Accordingly, programming on Options Jive may include new conversations on topics that haven't been previously featured on the network. It should be further noted that Options Jive is also more conceptual and theoretically-oriented, as opposed to the Market Measures series, which can be highly empirical in nature. With corporate earnings currently in the spotlight, we wanted to highlight a previous episode of Options Jive entitled "Earnings Volatility Explained." This content goes hand-in-hand not only with current market activity, but also some recently produced episodes of Market Measures. Corporate earnings and stocks/options are intimately linked because the price of a stock is often founded on earnings expectations. Therefore, when a company announces their quarterly earnings and ongoing profit/loss forecast, prices will typically fluctuate to adjust for those expectations. The uncertainty associated with an earnings announcement is typically represented by an increase in implied volatility (market price of options) in the month that earnings announcements occur. This can be one reason that implied volatility may differ across the term structure (listed months) of a stock's option chain. For example, if the earnings month is July, one might find that month's implied volatility inflated versus August. In this episode of Options Jive, Tom Sosnoff and Tony Battista kick off an intriguing conversation around trading earnings announcements. Specifically, the hosts examine some research done by the tastytrade research team that studies the implied volatility of some sample stocks as they get closer to earnings. One concept the team discusses frequently is a stock's "implied move" for earnings. The implied move is calculated by adding the prices of the earnings month at-the-money call and put (i.e. the long straddle) and then dividing that value by the price of the stock. So if stock XYZ was trading $30.00 and had an earnings month at-the-money call priced at $0.80 and put priced at $0.85, the implied move for XYZ on earnings would be 5.5% ($1.65/$30). That means the options for XYZ's earnings month are implying a move of 5.5% on the day of the announcement. On this episode of Options Jive, Tom and Tony discuss the results of a small study done by the research team that examined the earnings of AMZN, NFLX, and SBUX. The metrics they focused on were the earnings straddle price, the implied percent move, and the earnings cycle implied volatility (IV). 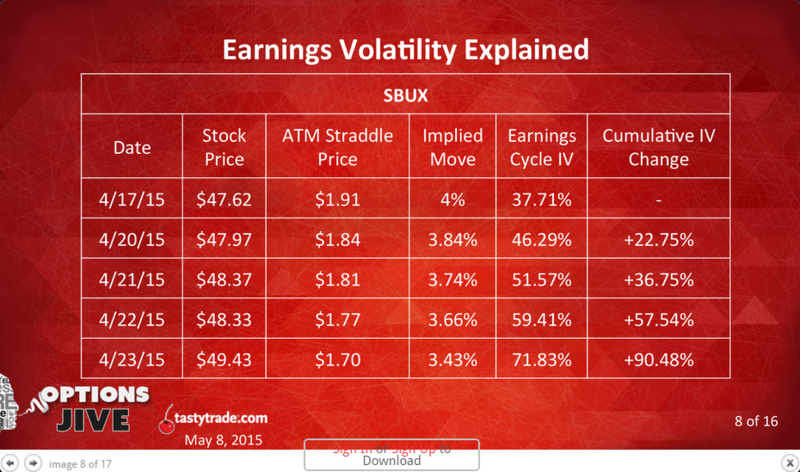 As you can see from the information above, the earnings cycle implied volatility in SBUX increased considerably as the event got closer. However, one can also see that the value of the front-month straddle actually deflated. Had a trader bought the SBUX earnings straddle for $1.91 before earnings they would have actually lost $0.21 per contract on route to the actual earnings day. In each of the three stocks, the study revealed a similar pattern. While the implied volatility of the earnings cycle went up as earnings got closer, the implied percent move remained mostly constant. We encourage you to watch the entire "Earnings Volatility Explained" episode of Options Jive, as well as the rest of the content in this series. The episode featured on the blog today can be accessed here, while the entire Options Jive library can be accessed here. As always, tune-in to tastytrade live!